Raksha Bandhan – August 2nd « Dr Deborah Swallow – Global Cultural Diversity..
Raksha Bandhan is a very beautiful and important festival. It celebrates brotherhood and love, promoting harmonious coexistence between all. It is mainly celebrated in Northern India. Raksha Bandhan is a significant event in the Hindu Calendar and the importance of the brother-sister relationship is emphasised throughout. What do the words Raksha Bandhan mean? Raksha means ‘protection’ and Bandhan means ‘to tie’ . This is because during the festival sisters tie a rakhi, a bracelet made of interwoven gold and red threads, to their brothers hand. This celebrates their relationship. Nowadays, other people tie rakhis as well such as priests to the hands of their congregation, between close friends, to soldiers and even the prime minister receives a rakhi. Rakhis symbolise love but what else do they mean? When a woman ties a rakhi to her brothers hand or the hand of a man it is then customary for him to honour his religious duty and protect her. He will often take a life-long vow to do this. Rakhis are said to be blessed with sacred verses and encompass the words that they have been blessed with. As well as this, they are believed to remove sin from one hand and provide safety to the other. The protection given by a rakhi is believed to remain for a year. Does a religious service happen with the Rakhi tying? Yes. Family members arise early in the morning to prepare for the service. They take a bath to purify mind and body before any preparations. Incense sticks, rice grains, sweets are prepared along with the Rakhi thread. 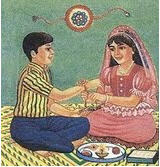 The sister will put kum kum powder on her brothers head and offer sweets. O Rakhi I pray that you never falter in protecting your devotee. At the end of the prayers, the sister places a sweet in her mouth and her brother will give her a small monetary gift of appreciation. Musical celebrations, cards and gifts will then be given and the family celebrate together. Raksha Bandhan is a significant event in the Hindu Calendar and the importance of the brother-sister relationship is emphasised throughout. This entry was posted on Thursday, August 2nd, 2012 at 7:00 am and is filed under days of significance, General, other interesting stuff, social practices . You can follow any responses to this entry through the RSS 2.0 feed. Both comments and pings are currently closed.